I was out of pocket last weekend as I was visiting my grandchildren who moved from Alaska to Virgina. It is so nice to have them back on the east coast again and it is close enough for me to drive up and see them. 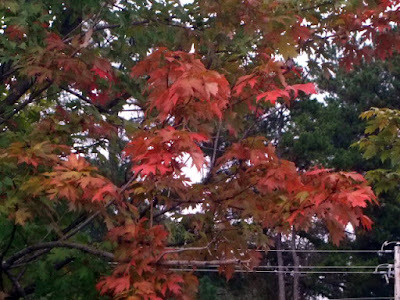 The leaves had begun to turn in the Carolina's and Virginia and today I noticed this tree in my local Rite Aid (Atlanta) showing the first signs of the season. Leaves have been falling early this year and that is usually indicative of a mild winter...or at least that is what the Farmers Alamanc always said. It was a marvelous visit and my three raviolis are getting so big. The twins are now in Kindergarten and Kit Kat is in the 5th grade. They sent me home with costume orders for Halloween so I spent Saturday afternoon at the fabric store. But, before I hit the fabric store I did a little treasure hunting. 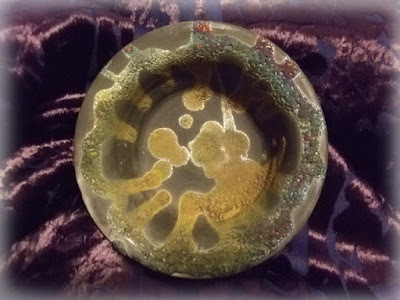 Found a slew of interesting items this weekend, lovely Raku pottery piece. Small but with great iridescence. When you wanted to take your Princess phone to Queen you put a silverplated cover on it. 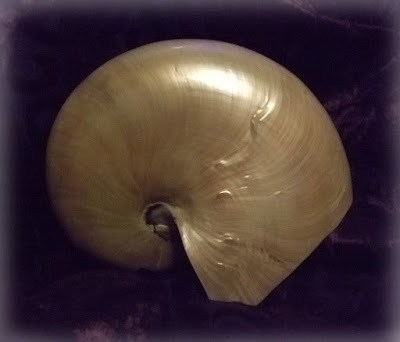 A find for the Sea Witch, gorgeous pearl Nautilus shell. Lovely Czechoslovakian art, drink glass. Signed on the bottom and numerically marked. Still looking up the info on the artist. 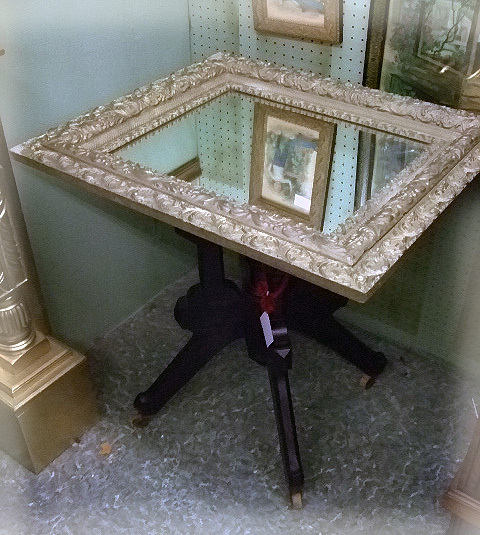 Marvelous find, a pair of retired Llardo pieces in perfect condition. 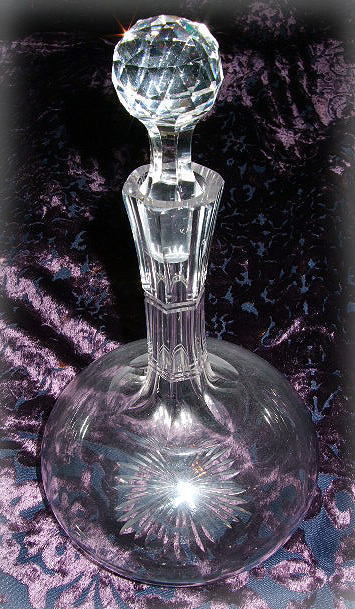 Decanters have been big sellers this year and this gorgeous turn of the century piece is full of fire and has original stopper. 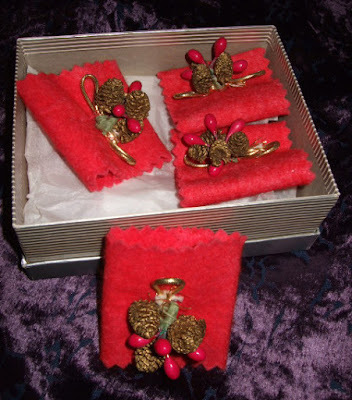 How cool are these, a set of handmade Christmas napkin rings from the 1950s. Red felt with pinked edges and tiny pine cones. 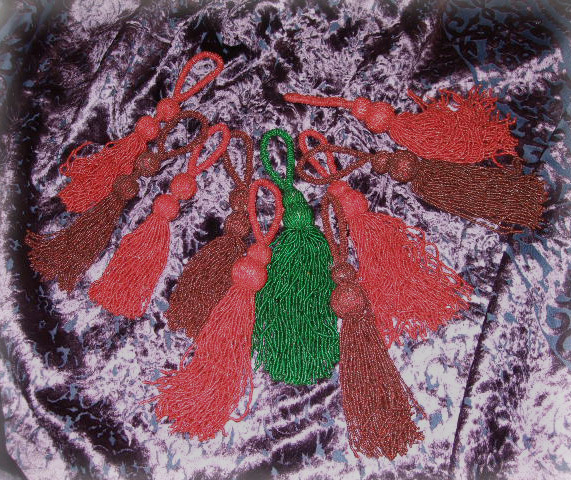 An assortment of beaded tassels in red, green and brown. Nice size and are great decorative elements. 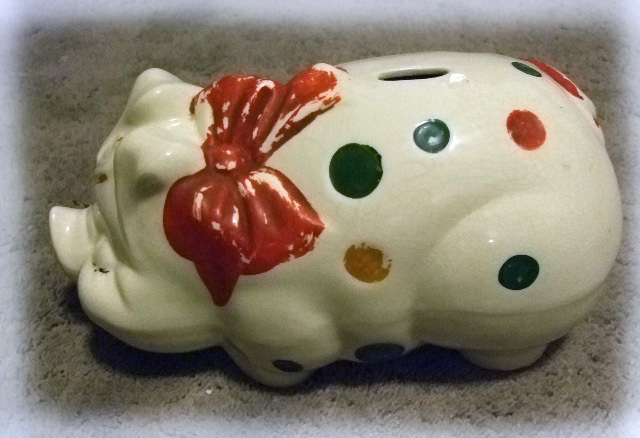 This was such a neat find, a 1940s cold painted piggy bank. Big piece and looks like McCoy pottery. 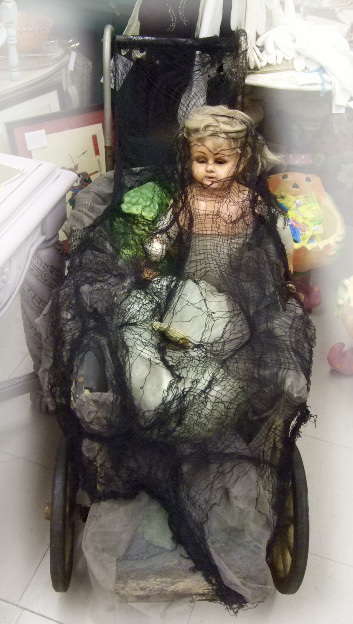 Started pulling out Halloween items for both spaces and put together a display using an old doll, vintage baby carriages, pumpkins and black netting. Victorian parlor tables have been flying out of my booth. I have sold four of them in 30 days. I've been wanting to do a Romantic Farmhouse piece by using this mirror in a gorgeous antique frame but could not find a base. 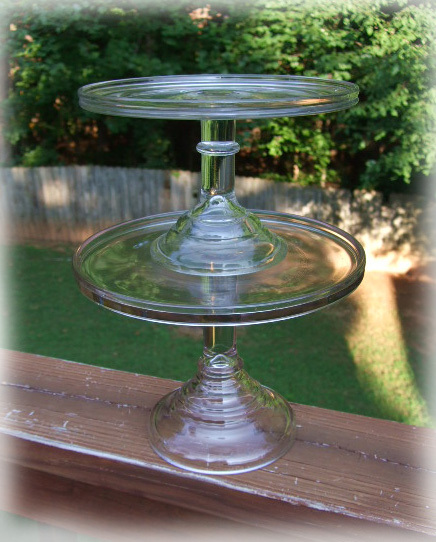 Finally came across an Eastlake table base at a junk store and I put the two together. Love the way it turned out. 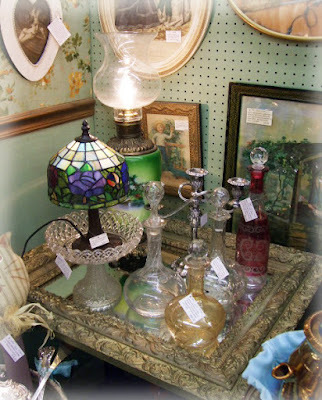 It's in my Victorian space and the antique decanters and lighting look marvelous on it. 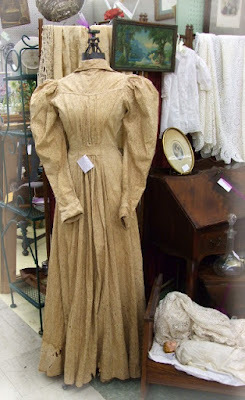 A weekend find, a calico wrapper...the day dress worn by American pioneer women. 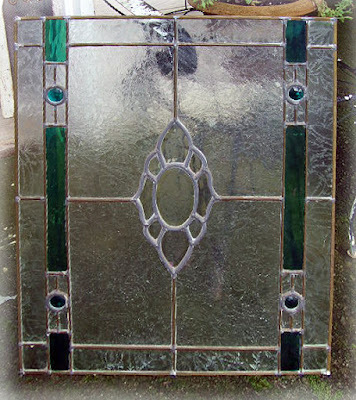 This beauty has seen lots of wear and is riddled with burn holes from working too close to the hearth. Still, it is a lovely display piece. 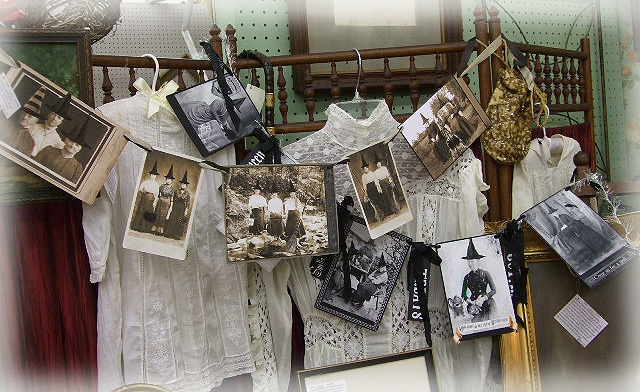 Hung lots of "witchey" garland. These were made by a local artist from Lilburn. 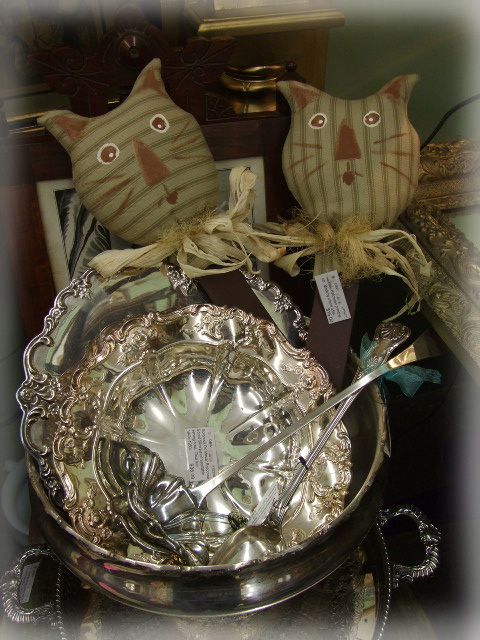 Pair of ticking cats are delightful Halloween pieces. 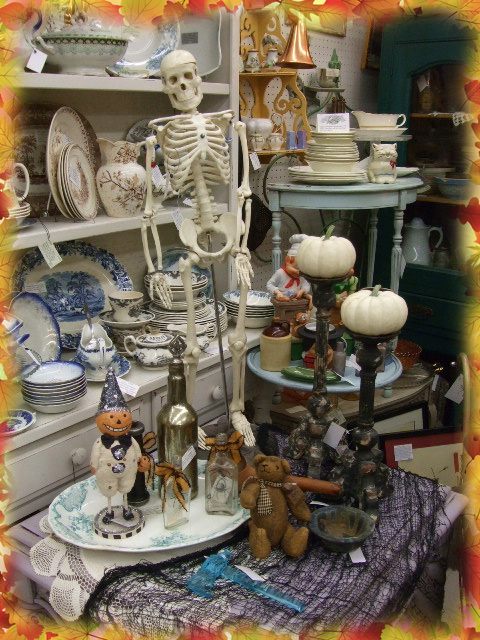 My Victorian space is ready for Halloween. Love the faces on these vintage Nerf pumpkins. 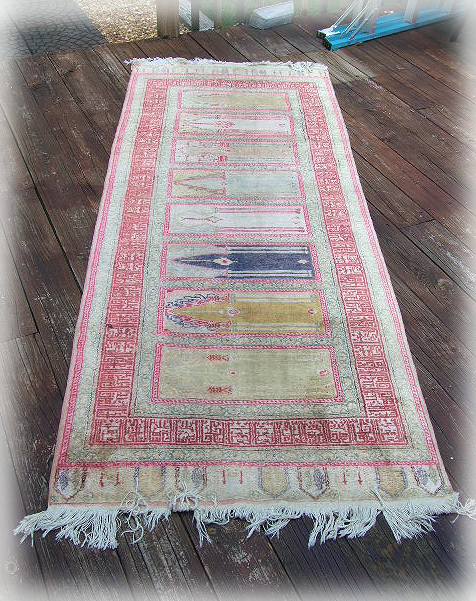 Hard to find as most have dry rotted out, this one is in great condition. Vintage witch noise makers and old hats. Love this vintage skeleton from a pharmaceutical company. 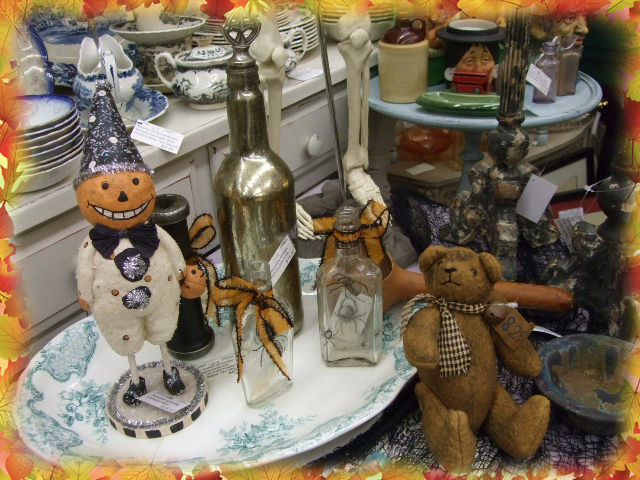 Vintage bottles, sweet teddy and a happy pumpkin man. Greetings, dear readers. It has been a lovely weekend and fall's first kiss has finally arrived to take the heat out of the long summer with a lovely autumn breeze and clear blue skies. I have had the AC off for the last few days now and the windows open to capture this lovely fall weather. 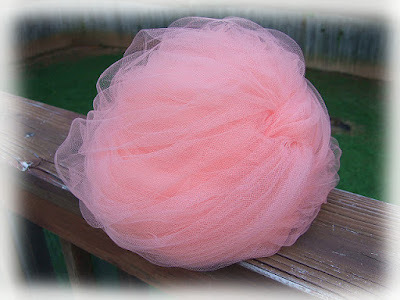 Days like this, I want to pull out my bags of fleece and sit in front of one of my spinning wheels and spin fiber. Soon, very soon. 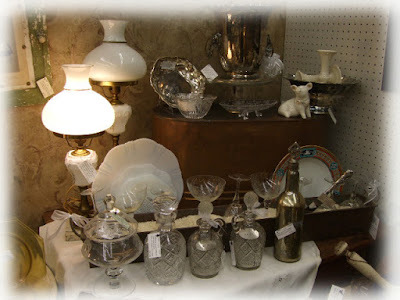 Did a little junkin on Saturday and found a few unique pieces as well as lovely glass. 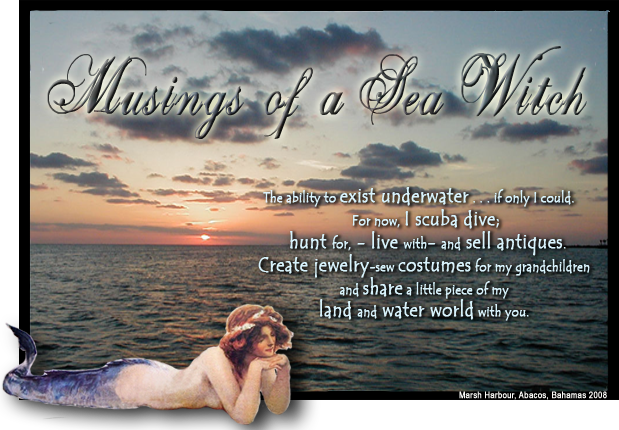 One of the fun things about searching for treasure, you never know what is going to show up. 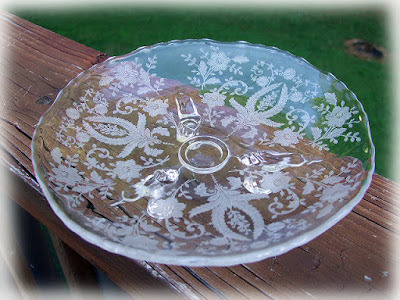 Glass seemed to be the finds this weekend and one of the first pieces I found was this lovely, Elegant Depression glass footed server. Etched crystal, it is in excellent condition. Another lovely piece, this antique blue opalescent ruffle edge footed brides bowl. I am head over teakettle for Early American Pressed Glass (EAPG) pieces. This is called Cross Fern, Co-op #101; Crossed Leaves. 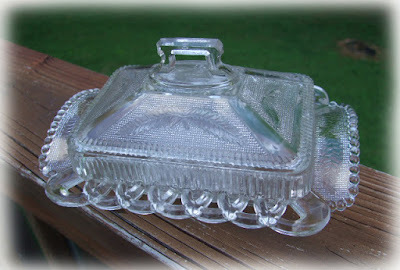 It's a Honey Dish from the 1890's by Co-operative Flint Glass Co. This is now part of my EAPG collection. Another EAPG piece. 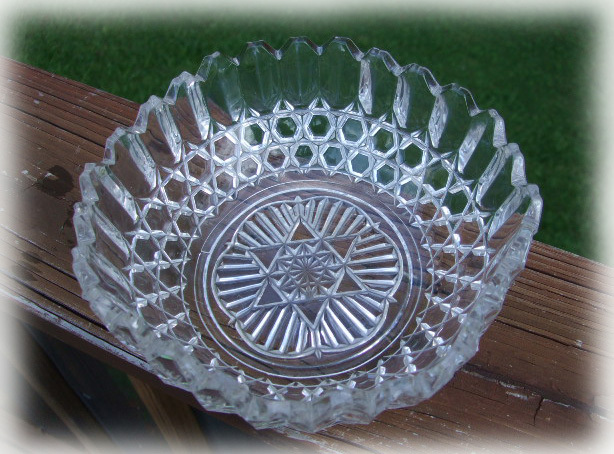 Heavy fluted bowl with Star of David in center. Once I find the name of this piece I will revise the post. 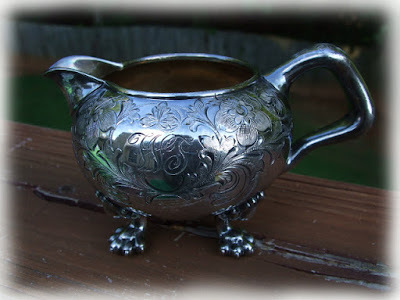 How cute is this adorable little creamer? 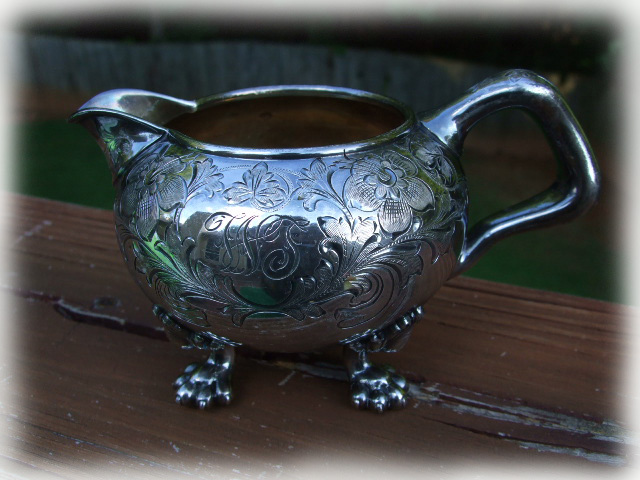 Lovely quadruple silver plate in as close to perfect condition as possible and just look at those sweet little feet. 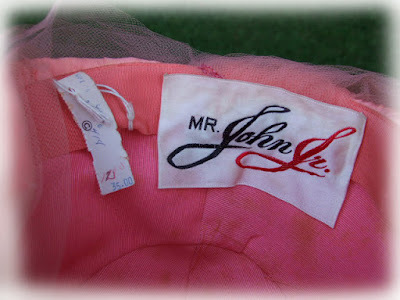 Nope, this is not cotton candy but a faboosh, Mr. John, Jr. vintage hat. Never worn, deadstock item still has the price tag attached. Price shows $35.00 - definitely a high end hat from the 1950s. 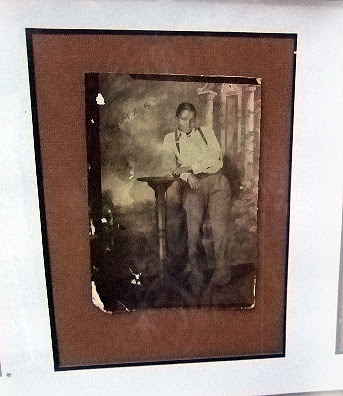 My favorite find this weekend, a fabulous set of antique photographs from the 1920-40s. Some of these are hand tinted. Love the clothing that they are wearing. My favorite image is "Emma" a woman dressed in men's clothing. 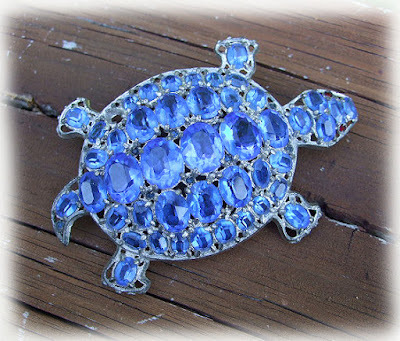 Reminds me of Idgie from Fried Green Tomatoes. 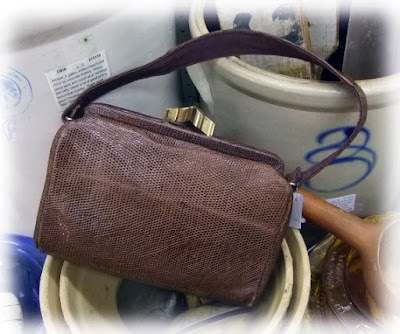 A terrific snake skin handbag from the 1940s is in lovely condition. Very little wear. 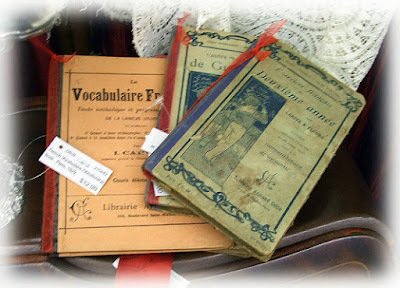 Set of three french grammar and vocabulary books from the 1900s. Did a little booth fluffing. Pretty vintage crystal pieces and silver plate. Brought in a nice selection of excellent quality, vintage men's hats. 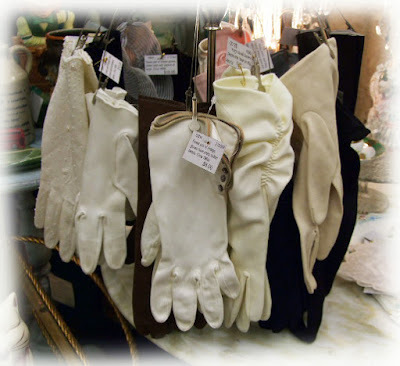 These are wonderful for fall. 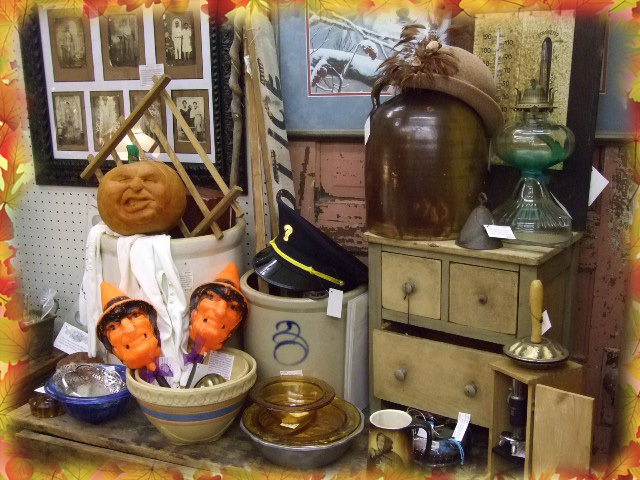 Antique crocks, vintage bowls and treenware are in my space at the Buford Queen of Hearts. The holidays will soon be upon us. 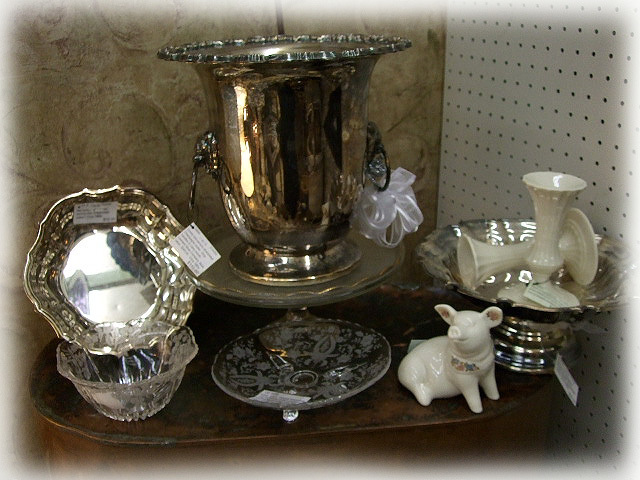 Prepare for dinners, parties and good times. Brought in some great antique, serving pieces. 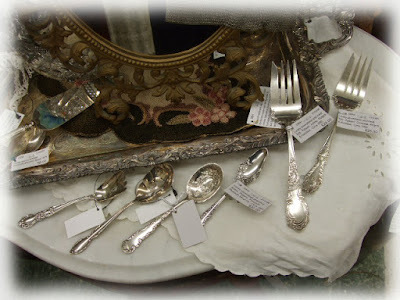 Victorian cold meat forks, sugar spoons and a grapefruit spoon. 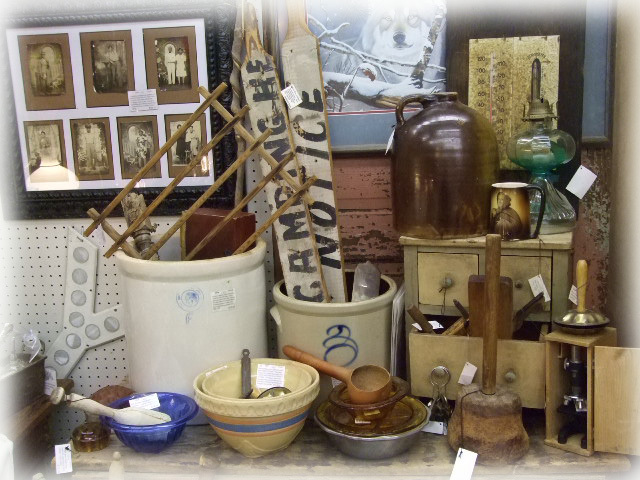 Three days of treasure hunting bliss. Most of Atlanta was out of town, thanks to the lower gas prices. This made it marvelous for someone like me who loves to meander around back roads in search of unique finds. 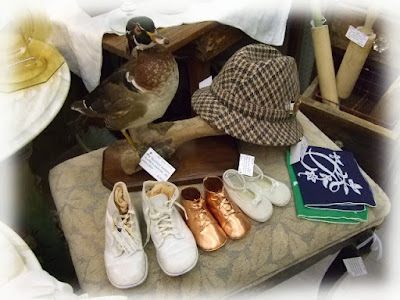 Lots of photos to look at and they also include items from a weekend ago. 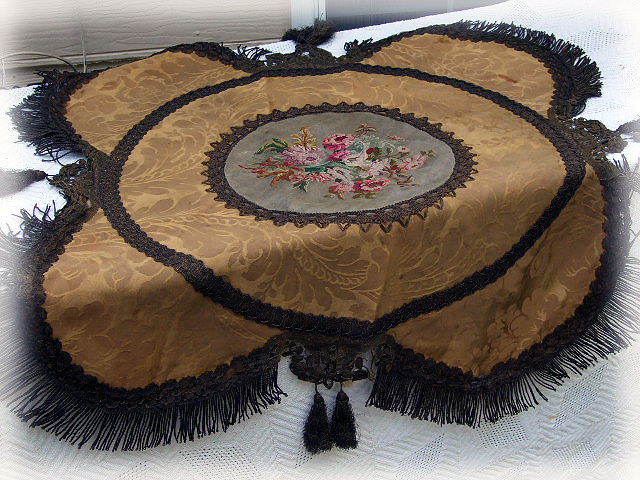 This gorgeous, early Victorian parlor tablecloth is rich with heavy bullion fringe and tassels along with a fine needlepoint picture on silk. 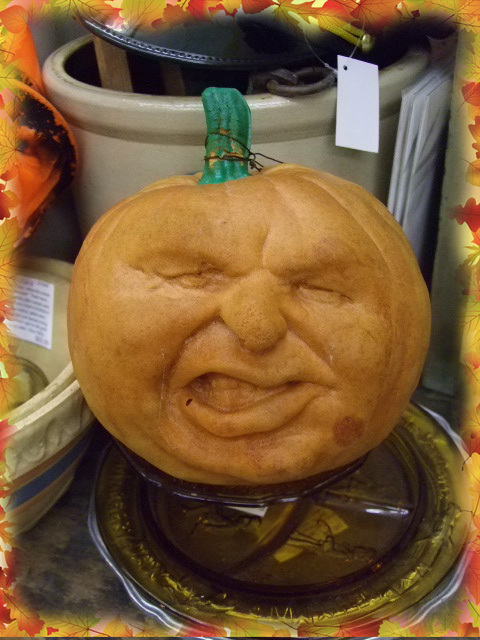 You never know what you are going to find at a thrift shop. Picked up a pair of these stained glass window panes. One is a little smaller than this one. Have wood frames coming for them so they can be hung. Both will find their way into my booth space at the Buford Queen of of Hearts. I am addicted to true Battenberg lace pieces and this gorgeous, parlor tablecloth is a winner all around. 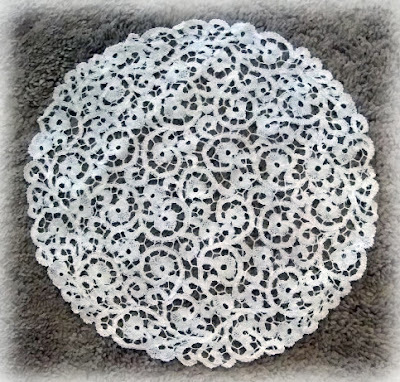 Fine lace work make this extraordinary. 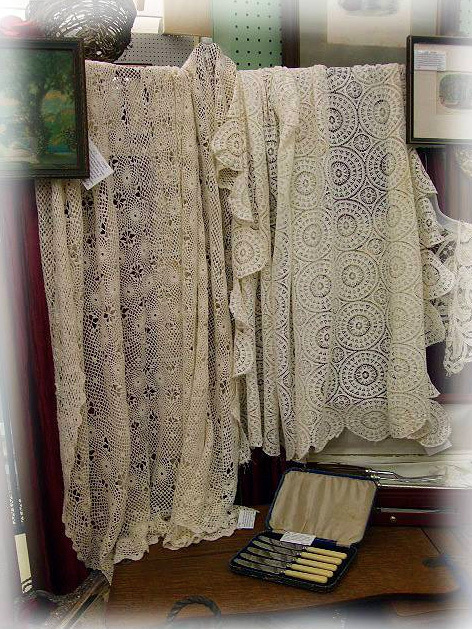 This was part of a linen lot that I won at a local auction. 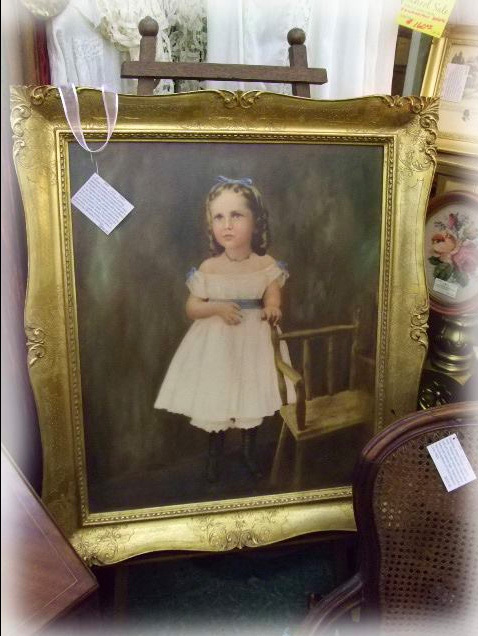 Exquisite Victorian oil on board painting depicting the portrait of a young girl with chair. 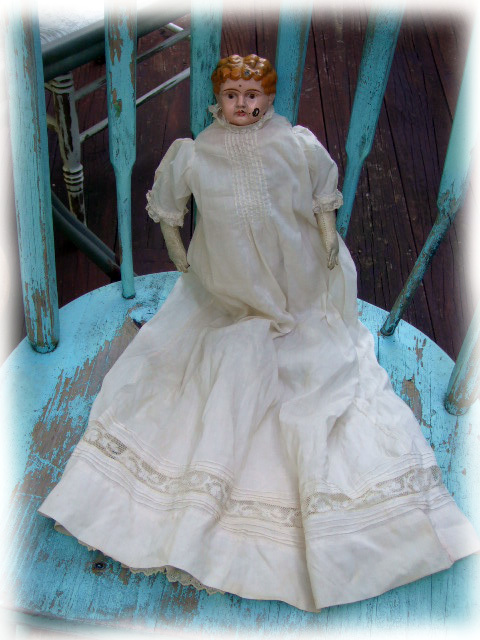 Dressed in the traditional clothing of the well to do Victorian child: white dress with blue ribbons in her hair and bodice, pantaloons and black high top shoes. 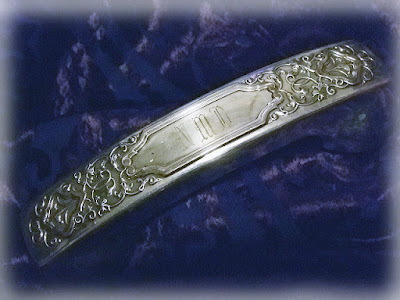 It is of excellent craftsmanship and very beautiful in detail. The painting is set in an original carved, wooden frame with gilt adornments. 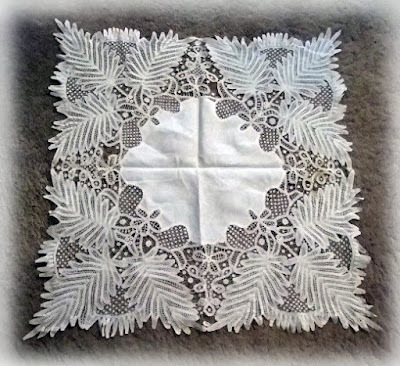 In perfect condition and dates at the end of the 19th century (1870-80s). This was an auction win. Pair of pretty antique tablecloths were part of the linen lot auction win. 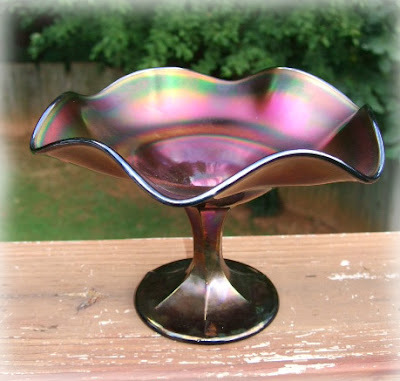 Found this gorgeous piece in Flowery Branch. 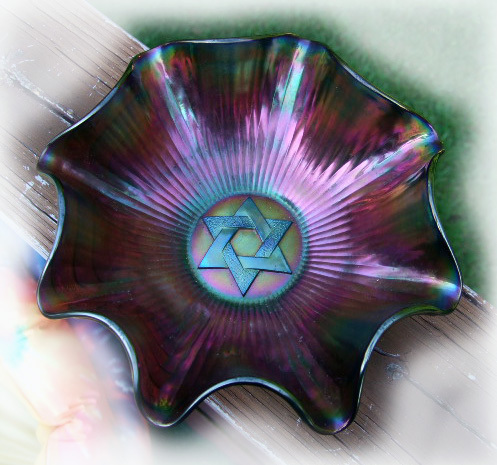 Rich in lustre and iridescence with a Star of David in the center. This is now in my personal collection. Stack'um high. Pair of lovely, antique cake stands. They even have the knife marks from years of cutting slices of homemade cakes. The stand on the bottom has a hint of sun purple to it. 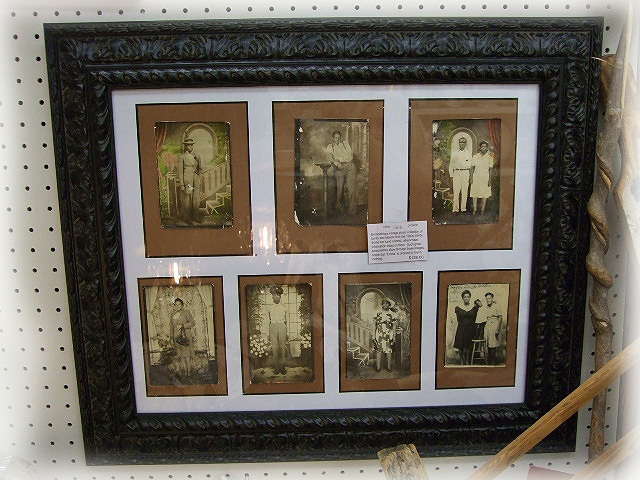 These are already in my Victorian space and priced to move as I got them at such a great price. 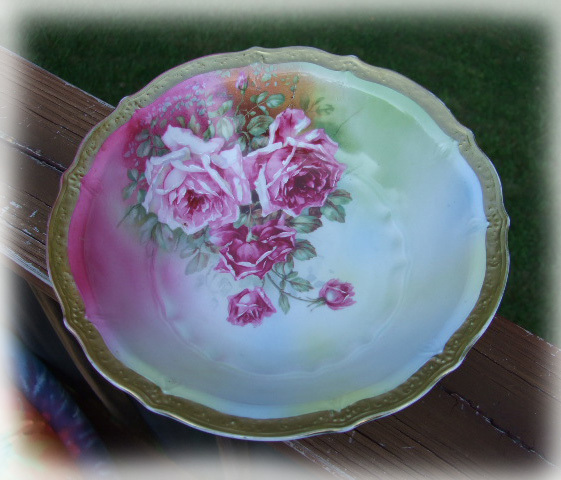 A thrift store find, really lovely Austrian bowl with hand painted cabbage roses. Beautiful silverplated candelabra polished up great. 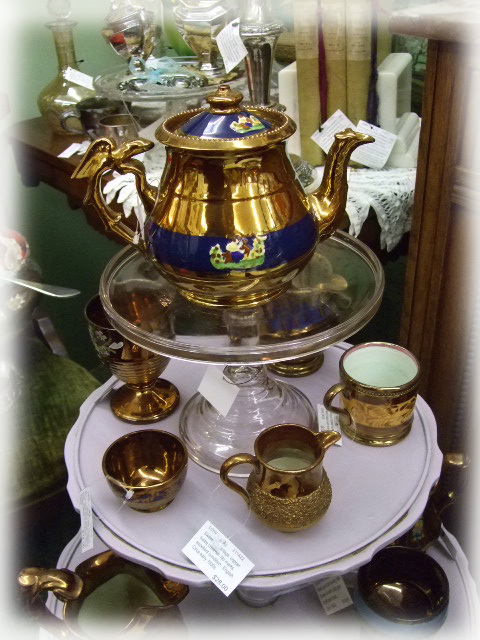 Brought in a nice selection of antique copper lustre ware, a type of pottery with a metallic glaze that gives the effect of iridescence. 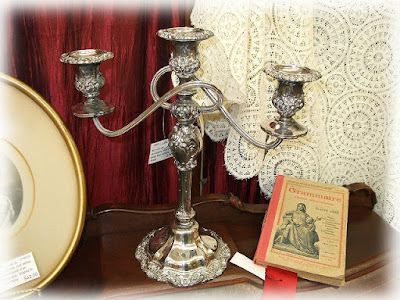 Years ago when rooms were lit only by oil lamps and candles, people loved to have things around them that shone and glowed in this soft light. The wealth had their silver and glass and gilded furniture: but the less well off had to do it in other ways. One of these was by having lustred pottery and china on their shelves and mantelpieces reflecting the light from the fire into dark corners and recesses. 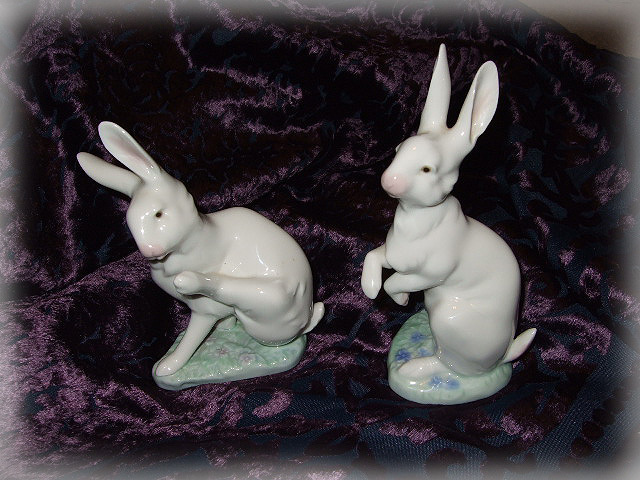 During the first half of the 19th century large quantities of Lustreware were produced in British factories. These pieces were produced from a soft paste ceramic making them easy to chip and break. Still, they were beloved items throughout the 19th century. Won a huge vintage glove lot at a location auction. They are all in my main space at the Buford Queen of Hearts. 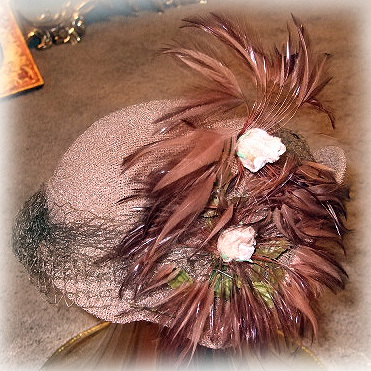 Sweet vintage hat is sassy fun. Now this is going green. 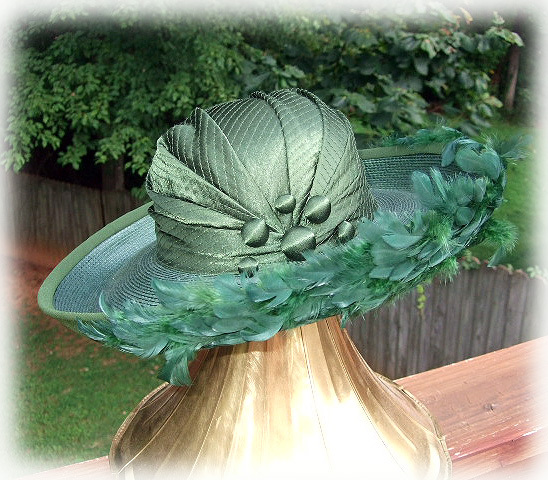 Big, sassy hat with feathers along the front brim. Gorgeous and heavy cut crystal bowl. Have never seen one like this, don't know if this is a married piece, an inventive repair or make do. 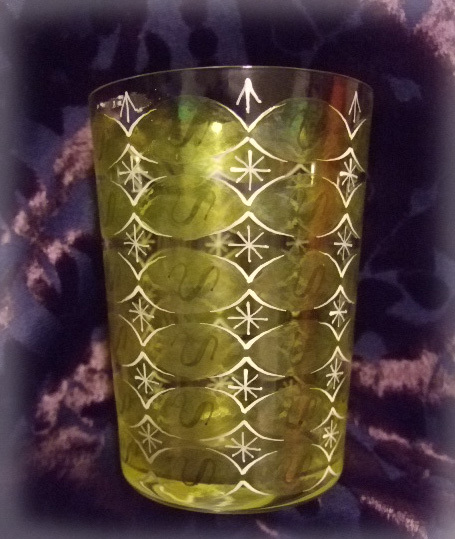 I have reached out to a cut glass site and will report back on what it is. 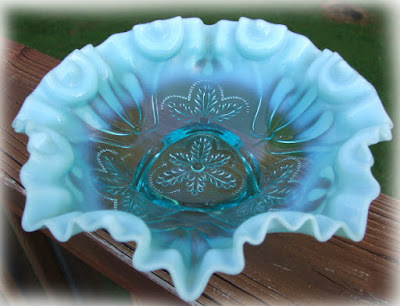 Another lovely carnival glass find this weekend. 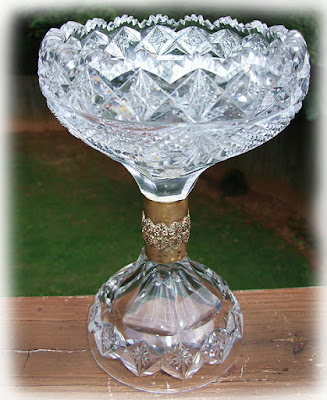 Brilliant lustre and in perfect condition. 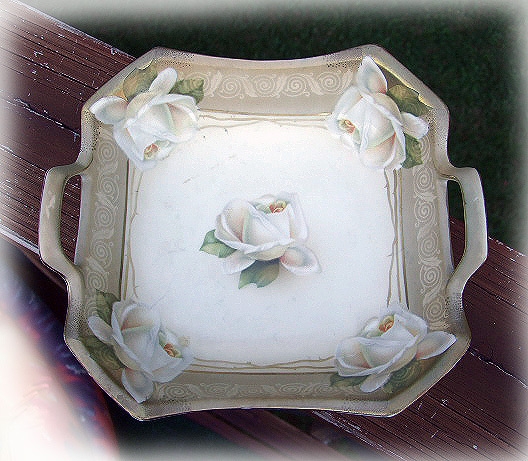 Stunning Austrian handled server has the prettiest white roses and soft taupe and gold design elements. A thrift store find. Found at the same thrift store, this delightful 1930s car coat pin is a big turtle filled with blue cut glass. 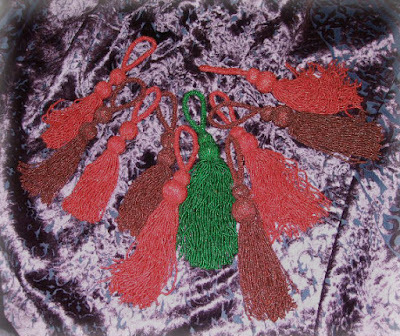 It's missing one stone but I think it is too cha cha for words. 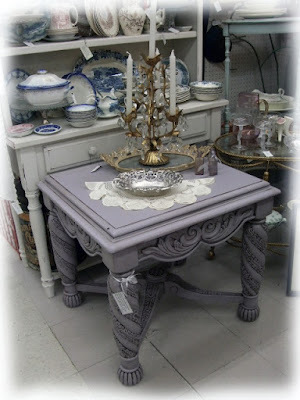 Did a chalk paint finish on this gorgeous table. It was terribly scratched up but had great legs. Everyone is on the chalk paint bandwagon these days and I have never seen so much taupe/gray furniture being offered. I decided to mix up a blend of gray with a hint of lavender for this table. I am over the moon with the outcome. This beauty is in my main space at the Buford Queen of Hearts Antiques & Interiors. And finally, this lovely piano scarf. 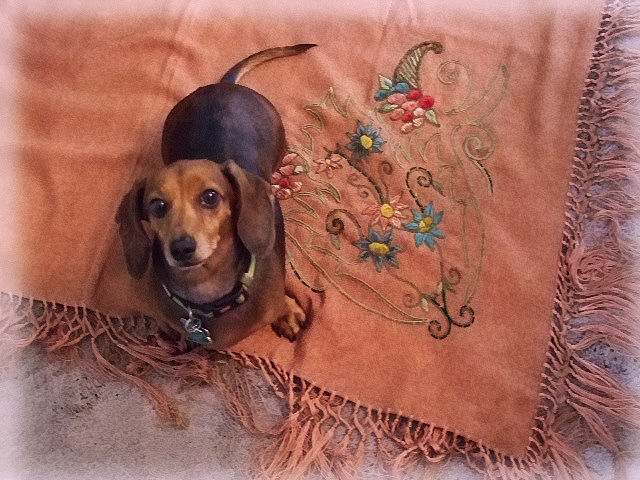 Turn of the century piece was a thrift store find and a scarf my sweet little girl decided to park on. 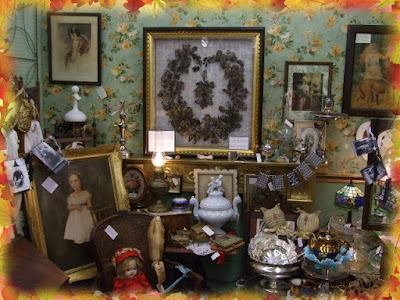 It was a rich two weekends for finding treasure and I really acquired some lovely pieces for my spaces at the Buford Queen of Hearts, but also a few keepers.